Redescription of Poltys illepidus C.L.Koch, 1843* With First Record of Male from India. A new species of Thelcticopis Karsch, 1884 (Araneae: Sparassidae: Sparianthinae) from the ‘Kans’ of Karnataka, India. A New Species of Cyrtarachne, Thorell, 1868 (Araneae: Araneidae: Cyrtarachninae) from the Sacred Grove Forests of Central Western Ghats, India. Genetic Profiling of Spiders of Semi-arid Habitat by Using Dehydrogenase and Esterase Isozyme. Spider (Arachnida: Araneae) Fauna of Delhi With First Report of Cobweb Spider Argyrodes bonadea (Karsch, 1881) from India. 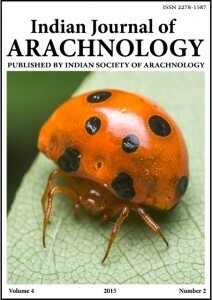 Redescription of Latrodectus geometricus Koch, 1841 (Araneae: Therididae) With a New Record of Male from Mumbai (India) . Two New Genera of the Family Theridiidae Sundevall, 1833 (Arachnida: Araneae) from India. A New Species of the genus Migrammopes (Arachnida: Araneae: Uloboridae) from India.